School may be out (or almost out for some) but camp outs and sleepovers will soon be abundantly on the agenda and it’s bug time. Fleas, ticks and lice can run rampant in campgrounds and other areas where groups of people hang out. The last thing you want to put a damper on summer fun is a lice infestation. 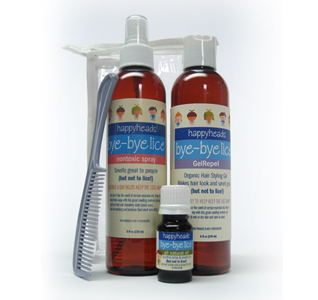 To at least keep the lice away check out Happy Heads Lice Prevention products. Happy Heads has lice prevention and lice treatment products that are all natural, not a toxic chemical in sight. The products really do smell wonderful, too. They have a light herbal aroma. Not only do they help keep the bugs away but the herbal spray and gel seem to condition hair and make it feel soft and wonderful. What an added bonus! If you do end up with lice you can easily get rid of them naturally with Happyheads patented enzyme based shampoo that kills lice on contact. Forget about using the toxic chemical shampoos that you find in the grocery and drug stores try Happyheads for a natural way to keep the lice away. My daughter is starting Kindergarten in the fall and I’m paranoid about LICE! I tried to email them to ask if they ship to Canada, but there was an error on their site, do you happen to have contact info for them?